An artist’s impression of the Union Oasis project. 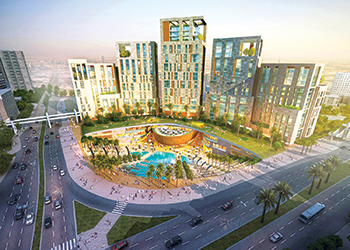 The Union Oasis project in Dubai, UAE, has taken a step forward with the city’s Roads and Transport Authority (RTA) issuing pre-qualification documents to companies interested in developing the five mixed-use towers above the Union Square metro station, a report said. The call for bidders to register for the project kickstarts what will be the first scheme to be completed under Dubai’s new public-private partnership regime, which is set to take effect on November 19, The National said in its report. Under the Union Oasis project, the towers will be built on a site above one of Dubai’s busiest metro stations. Last year, about nine million passengers used the station, which is one of the main interchanges for the Green and Red lines, it said. The towers, which will occupy 14,662 sq m of a total plot size of 37,885 sq m, are likely to include a mix of commercial, of fice, residential, retail and hospitality space. These will be connected at podium level and can consist of four basement levels, a ground and mezzanine level, and up to 20 storeys above ground, the report said. The public-private partnership being adopted for Union Oasis is expected to be the first in a series of projects that will tap private sources of finance for infrastructure improvements. The last date for project registration is December 3. The RTA will then issue the tenders with a bidding deadline for next April and the winner will be selected the following month, said the report. Meanwhile, RTA has awarded contracts worth Dh60 million ($16.3 million) for building internal roads at Oud Al Mateena 2 as part of its plan to improve infrastructure in residential neighbourhoods. Mattar Al Tayer, the director-general and chairman of the RTA, said the project was part of the five-year plan (2012-2016) for paving internal roads in a number of residential districts in Dubai. Last June, RTA had awarded contracts for constructing internal roads at Al Barsha South Two (District 671) extending 16 km, as well as installing a rainwater drainage network and LED (light-emitting diode) streetlights, and upgrading electricity and water network.